In Bangladesh in recent times, the term, “Muktijuddher Chetona” (‘Spirit of Liberation war’) has become a much used if not much abused term in the political vocabulary and yet so far no one has cared to explain what it really means in concrete sense. Furthermore, the concept was also never promoted nor discussed, neither during the pre-liberation movement period, nor during the liberation war and not even in the immediate aftermath of independence. 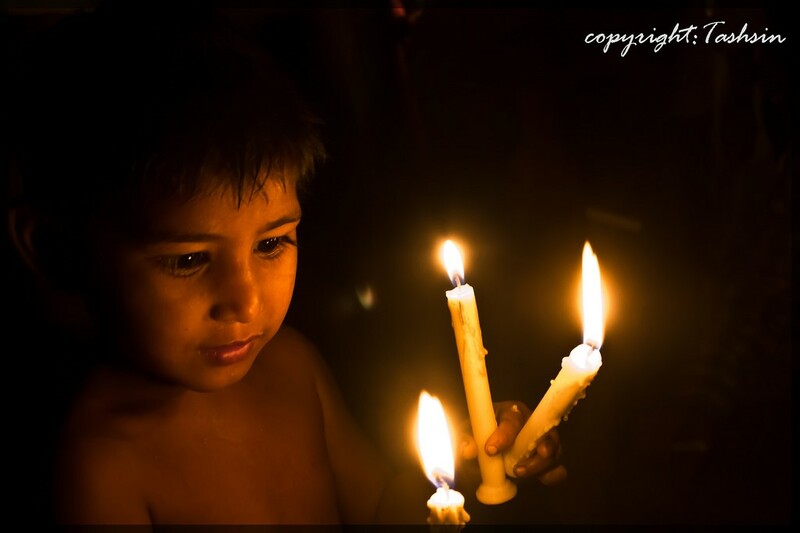 It gained currency mainly during the last decade or so of Awami League’s (AL) rein and more precisely at the time of the Shahbag movement of 2013 where the movement’s leaders invented the term as a slogan mainly to inspire people to demand extreme punishment of the 1971 war criminals who were facing trial at the time. Most alleged war criminals have since been tried and most have been hanged but the term, “Muktijuddher Chetona” continues to occupy political space, evoking much interest among some to explore what it means or denotes in concrete terms. Notwithstanding, while these scepticisms are legitimate, as the term has got quite a bit of currency and is used frequently by the ruling party (the party that not so much to inspire the whole nation but to brand and separate people and political parties along some sort of villain/saint ideological lines, it may not be a bad idea to attempt constructing an operating objectively verifiable definition of the term, for no other reason but to assist tracking progress and more importantly, take governments to account on the basis ‘chetona’ or spirit of liberation through measurable parameters. In sum ‘exploitation free’ means a state where citizens are endowed the right to live in freedom and with dignity and with access to equal opportunities to advance themselves economically, politically and socially equitably and also to live as equals. Now coming to defining ‘Muktijuddher Chetona’, some have suggested that a more credible and objective way to define the concept would be to consult various movements and pledges that led firstly, from the autonomy movement for East Pakistan to liberation war and independence and principal among these are – the pre-independence 6 point movement document that promoted the vision of an autonomous and ‘discrimination free’ East Pakistan; the All Party East Pakistan Students 11-point demand that articulated more explicitly and for the first time a vision of an ‘exploitation’ free society for the then East Pakistanis; then the 17th April, 1971 ‘Proclamation of Independence of Bangladesh’ by the government-in-exile that outlined the vision of a society based on “equality, human dignity and social justice”; and finally, the 1973 Constitution of independent Bangladesh that included in its preamble a clear and agreed vision for the country which is “free from exploitation in which the rule of law, fundamental human rights and freedom, equality and justice, political, economic and social, will be secured for all citizens.” In this regard, some thus stress and quite rightly so, that apart from these pledges and documents all other terms, concepts and slogans that are promoted as ‘Muktijudder Chetona’ are ‘bakwaz’ (bogus) as these are done with an ulterior motive, not to advance the country but to complement narrow political objectives. If indeed, we take these documents and pledges especially the 1973 Constitution and construct an operational definition of “Muktijuddher Chetona”, we find that the concept specifies ideals and the principles for advancing that not only reflect the aspirations of all people but also provides a framework that can be used to measure progress and hold governments accountable more objectively. It is evident from the table above that Bangladesh has done well economically and the government can indeed claim some but not all the credits for it and this is because so far as economic progress is concerned main contributors, the namely Ready-Made Garment (RMG) and manpower exports are predominantly private sector driven and also the policy foundations that advanced these two sectors have been laid decades ago from which the dividends are flowing now. On the other hand, where government could assist and had the obligation to do so but failed especially in the RMG sector is in the area of guarantee of fair wages for and safety and security of the workers. It took a tragedy like Rana Plaza that killed scores and injured and an international outcry that exposed sub-human conditions prompted the government to act. Things in RMG have improved but more are needed. Bangladesh has also done well in education and health mainly with NGO support especially in rural areas. Indeed, when one compares Bangladesh’s impressive economic growth against non-economic values – those that have been enunciated in the Constitution and those that I believe define ‘Muktijuddher Chetona’ or spirit of liberation war such as equality, accountability, freedom, human rights, rule of law etc. – the picture is anything but flattering. 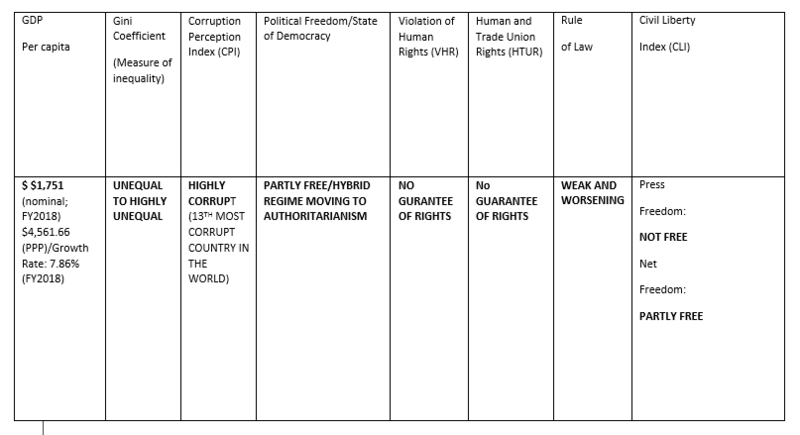 The scorecard reveals appalling deteriorating trends in inequality, corruption, freedom, rule of law and human rights. Rising inequality which is often triggered by a number of factors but mainly due to corruption and absence of accountability and rule of law, is becoming endemic by the day and statistics often do not portray the real picture of the extent of inequality and vulgarity of show of wealth that characterize the socio-economic scenes in Bangladesh these days. A friend who recently returned from Dhaka attending a wedding reported that among many dazzling and costly arrangements the peak was a Russian Ballet group that the bride’s father had hired and god knows at what cost, to perform at the wedding. Indeed, in the ever changing iniquitous and status mongering snobbish ultra-rich social behaviour of Bangladesh, in which show of wealth is celebrated and not frowned upon, there has been a radical shift from the expensive ‘Korbanir Goru’ of bygone years to ultra-expensive wedding ceremonies of the present time! On the issue of human rights, less we talk about is better. Past decade has been a decade of numerous extra-judicial murders, enforced disappearances, arbitrary jailing of political opponents, attacks on student and worker protests. Rule of law, freedom of speech and freedom of assembly are an anathema in present Bangladesh. Prime Minister Sk. Hasina however, has a different notion of human rights. In a recent interview with an Indian journal she argued, “We ensured people’s human rights. We always value the human rights for the people. Human rights do not mean security or safety only, it also includes people’s food security, their health security, their education, their housing and wellbeing. A person wants a better life. If we can do it, it means we are ensuring human rights.” Difficult to agree with such selective notion of human rights. Problem with such selective notion of human rights is that without the guarantee of safety, security and dignity of all citizens, economic and social benefits flow only selectively and iniquitously and we see the results already. On the issue of human rights Bangladesh’s record is so pitifully depressing that citizens right to vote and choose who they wish to be government by, has also become an unlikely aspiration if not risky. In sum, when put against an operational definition of ‘Muktijuddher Chetona’ representing values that are in the Constitution, the ruling Awami League that has given currency to the term and claim to be its sole champion and uses it frequently to glorify itself and demonize its opponents, portrays an image that is hardly glorious and not befitting of a champion of the spirit of the liberation war. Whole nation needs to unite and fight against the fake and misleading notion of ‘Muktijuddher Chetona’ and re-build the nation by invoking the real values of ‘Chetona’ namely democracy, human rights and social justice, the very values that the founding fathers and the nation as a whole once aspired and fought for, into the body politic of the nation.